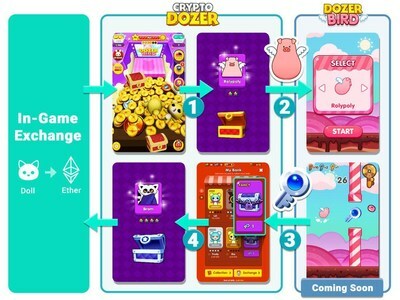 SEOUL, South Korea, April 17, 2019 /PRNewswire/ -- A new blockchain game, CryptoDozer, developed by PlayDapp, hits record high item transactions, averaging 30,000 weekly, moving ahead of last year's top blockchain game: CryptoKitties. CryptoDozer is a blockchain-powered arcade game with the aim to collect various CryptoDolls, valued from $0.16 to $11,000 in cryptocurrency, by dropping coins. The game has seen thousands of users successfully withdraw ETH since its launch. Even the first of its highest ETH value CryptoDoll - worth 70ETH - has been won by a player in Spain last week. CryptoDozer has seen a significant number of winners, with each big winner having a range of crypto experience. Such as its 30ETH winner - the second highest possible prize - a college student from Vietnam. As well as the 70ETH winner - worth approx. $11,000 at the moment - a real-estate worker in Spain. CryptoDozer is converting users from non-crypto friendly to crypto gamers. Additionally, out of four of the largest winners to date, only one has played Crypto games extensively before playing CryptoDozer.